Expert advice for business owners. ​A collection of articles on this site. The World's Most Comprehensive Article On Business Brokers. From fees to how to find the right broker ... everything you ever wanted to know on the subject, and then some. Some Reviews Of Brokers In The UK & Why It Pays To Be Very, Very Cautious When Choosing One. ​There Are Two Ways To Sell A Business - Asset Sale vs Share Sale. One Can Earn You A Lot More Than The Other. ​The Internet's most comprehensive coverage on this important topic and one of our highest visited pages every single day. A must read for any DIY business seller who's not being professionally advised. ​How To Impress Investors To Buy Your Business (Or Finance It). ​A detailed look at all the attributes that persuade a business buyer to pay a higher price for your business. What you think they want is not really what they want at all! A Comprehensive List Of All The Places In The World To Advertise A Business For Sale﻿. An offer available on only this site to get a free listing at BusinessesForSale.com, Daltons Business and other online business-for-sale portals. A Detailed Guide To The Valuation Mistakes That Over 90% Of Business Owners Make. No, a business isn't worth a multiple of earnings or even a multiple of some fancy term like EBITDA. Spend some time on this piece and you're guaranteed to be in a far better position to get top price for your business. ​How To Sell Your Company For A Lot More Than The Valuation. ​Here are seven important steps you need to take to blow the valuation right out of the water and walk away with a lot more than your business is worth. Signed Up With A Broker & Not Getting Many Enquiries? Here's Why. It's not unusual for business owners to sign up with a broker and have hardly any enquiries (except from the odd tyre kicker). This light hearted article explains just why your phone isn't ringing off the hook. ​What Business Brokers Say ...And What They Actually Mean. ​Here's what you're likely to hear from business brokers and here's how to interpret what the broker is really saying. We include tips on how best to play these situations and come out a winner. How Do I Choose The Right Broker To Sell My Business? ​80% of businesses coming to market don't end up finding a buyer! That's partly because most business owners don't choose the right business broker. How Do I Sell My Business Myself Without Using A Broker? ​A detailed look at the whole process to arm you with all you need to conduct a DIY sale without risking the use of a business broker or business transfer agent. One needs to be very careful when responding to buy-out offers. Here are the top ten things you need to know about how to play this hand. How To Successfully Sell An Insolvent Business﻿? Most businesses we talk about on this site are successful, going concerns. What happens, however, if the business is insolvent or close to insolvent? Mastering The Ad Copy That Will Sell Your Business Successfully. Can I Extract Any Value From A Business That Has Retained Losses? Can you exit your business by selling your retained (accumulated) losses for someone else to use against their profit to reduce their Corporation Tax bill? And how much can you get for your loss making business? 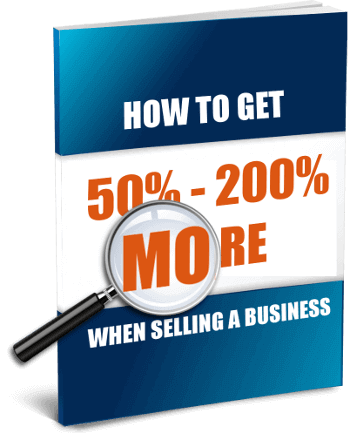 A Secret To Getting 300% More Buyers (And, Therefore, A Better Price) For Your Business. The more buyers you have competing for your business the higher the price you're going to walk away with. Learn the simple changes you can make to get three times the prospective buyers. Importantly, they'll be better qualified, more highly targeted candidates! A Business Is Not Worth "Only What Someone Is Willing To Pay For It". It's a common misconception that you have no influence over how buyers value your business and therefore how much they are willing to pay. But there's a reason why some firms sell for a lot more than similar other firms ...even when they've never made a profit. ​Over 70% Of "Business Buyers" Are Not Genuine. Here's How To Tell Good From Bad. ​What are the typical business broker's fees / charges? We cover the subject with various example of not just fees but, importantly, fee structures. ​Some of the best brokers specialise in selling businesses in a particular industry or sector. Using one of these can make a big difference to price. We explain the pros and cons of using a sector specialist. ​Got A Free Valuation For Your Business From A Business Broker? Throw It Away! ​Business brokers simply love giving free valuations. Free valuations costs them nothing but do persuade business owners to sign the broker's contract. Business broker valuations are generally not worth the paper they're written on. Confidentiality - Why It's Important, And How You Are Going To Lose It! The biggest mistake that business owners make is not realising that every business is being closely tracked for "selling intent". The moment you start doing research on valuing businesses or selling businesses you immediately get red flagged ... by all the wrong types of people - the bottom end business brokers. Directories Of Business Brokers & Business Transfer Agents. If you want to start researching brokers, Google is not your friend. Most of the best brokers don't figure in Google results. Business Brokers Make All Kinds Of Claims. How Do You Recognise What's Real & What's Not? Did the broker say he's got a list of thousands of eager investors who're hunting for businesses just like yours? Or that he can sell any business? Is there a way to test the claims without committing to a contract? Business Brokers Sharp Practices That Vendors Need To Watch Out For. If you're selling a business and intend using a broker, you need to know that not all you see in the press about brokers & Business Transfer Agents is true. We have some excellent brokers in the UK. We do, however, also have the other type. ​Some brokers post an ad online and sit back. Others are a lot more proactive in hunting buyers down. You pay more for the latter broker, but is he really putting in the work? Here's how you can motivate your broker. ​​List Your 'Business For Sale' Ad Free At These Premium Marketplaces﻿ (A £500 Saving!). It's so useful to have them all in one place that we can't think why nobody has done this before! Anyway, here's a list of ﻿all the top places to list a UK small or medium sized business for sale. Shareholder Disputes Interfere With The Sale Of Your Business. How To Resolve Them? Even a minority shareholder holding just 1% of the shares can hold up the sale of a business if they are not happy with the business being sold or the price being offered. There's no shortage of people offering to value businesses - most brokers offer a free valuation service - but can you rely on these figures? And how can you get a professional valuation done, a valuation that reliable enough to guide your strategic decisions? Whatever Your Current Asking Price, I'll Pay Double That To Buy Your Business Today​. ​Yes, it's a genuine offer. But what's the snag? The Harsh Realities Of Selling A Small Business. Most business owners who believe their business has value are going to be disappointed. It may have value to them but not 'resellable' value. So if you own a small business, it's likely worthless ...unless you make some changes now! Fancy being a business broker? Or working for one? How do you train to become a business broker? Do you need to qualify first? Why does negotiation involve several hours of actual talks and several prior days in preparation? Because that's what is required if you want to get the best deal. Negotiations for the sale of a business are a lot, lot more than just agreeing a price! How To Maintain Confidentiality When Doing Research About Selling A Business? It's very easy to let the cat out of the bag! When speaking with brokers there's a particular risk. Here's how you keep safe. ​All You Need To Know About Buying A Newsagent, Post Office, Corner Shop Or Convenience Store. ​This was the advice we put together for a paying client ​who was considering packing in the day job in the city and moving to the country to buy a newsagent type business. We release it now ​in the hope it will help other investors considering such a business purchase. Get Our Guide: Immediate Download On Signing Up For Our Newsletter. Sign up here.